"Your task is not to seek love, but merely to seek and find all the barriers within yourself that you have built against it." In the ever-growing industry of healing work with horses, there are many different interpretations as to what Facilitated Equine Emotional Learning (FEEL™), involves. In HorseJourneys, it is about having the horse lead you to where you need to feel next. As Barbara Rector, director of Adventures In Awareness says, "It is learning to see through the lens of the heart." FEEL™ is about connecting to your more real and truer self - becoming congruent. It is the deep emotional and spiritual alignment with the physical where one can begin to transform the heart. This work mostly occurs on the ground in a round pen, I like to call - the Reflective Circle. The work can also be in the saddle with a lead, or in the saddle at liberty. Facilitation of this work involves first educating clients and students how to utilize emotional strength building practices and exercises for connecting with their sensory body wisdom. The work then transitions to the client or student entering the Reflective Circle with the horse they have chosen or who has chosen them. Upon entering, they may set an intention for clarity on a personal issue, a life focus question, or just enter with an open heart to what comes from the interaction. Horses communicate through their behavior, body language, or telepathic communication. Our job is to be that bridge for what the horses convey through their body movements and gestures and help interpret any communications the client may receive. Basically, it is learning to interpret "horse-speak." It is horse whispering for a different purpose. Being a FEEL™ facilitator, I see our role as one of holding a safe containership for the client and the horse to meet in the heart, which may require no interpretation whatsoever. As a facilitator, this work does require having a clear and strong heart, as well as, knowing the many ways horses can reflect to humans. It is also vital to know the places and spaces horses can take people and how humans can integrate the insights readily available from these magnificent, sentient beings. Horses don't distinguish between the student or facilitator, so it is essential for the facilitator to be grounded, safe, and emotionally clear. Horses are masters of knowing the emotional awareness and content in each person often before the person is even aware themselves. Humans are masters at hiding their emotional Feeling states. In spending time in an FEEL™ session, people can begin to connect to healthy emotional patterns and disconnect from unhealthy emotional patterns because of the clear, non-judgmental, and instantaneous reflective behavior horses provide. In the Reflective Circle work, one can learn to connect to the natural rhythms of their bodies and the informative messages behind each of their feelings or physical sensation. Clients learn to slow down and in that slowing be able to listen to the unlimited information stored within their own bodies. It is in the being with a benevolent 1,000 pound animal, who communicates clearly and honestly what they feel, know and sense, that models for us how to break the constraints and restrictions of a lifetime's worth of disconnection from our emotional and sensory wisdom. In doing this work, there is a freedom and a return to one's creativity and passion that has often been imprisoned, becoming newly available. Horses never lie. We can trust them, and in that trust we learn to disengage from the practices of denying, withholding, or lying to ourselves and to others. We can come to a solid place within our selves that says, "I don't have to pretend anymore. And, I don't have to be with anyone who relates in ways that are inauthentic either." Horses wouldn't settle for such behavior. Why then do we? Haven't you been lied to enough? Aren't you exhausted with pretending to feel a certain way when you don't? And, aren't you tired of ignoring the signals from your body, only to be pursued by greater symptoms of pain or discomfort? It is a powerful person who can change limiting behaviors. Your body never lies to a horse, even if your words are saying another thing altogether, which makes for a powerful emotional learning environment. There's magic that comes when a horse "reads" you in such a way. It is as if the fourth chamber of your heart has permission to open for the first time and is seen, known and heard. Even with all its unattractive content of pain, sorrow, shame and hurt, you are seen through compassionate eyes. You fall into love in those moments. Horses mirror our present state of feeling and being, even the not so pretty sides of our selves. They also affirm our strengths and talents. Each session with the horses can reinforce your connection to the person you most long to be. When we have the experience of being loved over and over again within the horse's presence, they can usher us into a connection with authentic feeling and being unlike we've ever known. With practice, it becomes easier and easier to hold these states of consciousness within all our interactions. We learn through the experience of being loved. Sometimes we need an outsider to love our ugly parts first. In that non-judgmental love, we discover it is okay to forgive and let go. Horses provide the direct experience of acceptance for what is. Horses also do not accept you being any old way with them, either. They will listen to what you have to say about that anger, but "acting out" that anger around them poses a threat. Emotions are contagious. And for highly feeling beings, horses will pick up on that which you are feeling, whether you are aware of those feelings, have control over them or express them responsibly, or not. This is the wide gap we need to bridge within ourselves and in all our relationships - learning how to responsibly express our emotions instead of irresponsibly acting them out. Karla McLaren, author of Emotional Genius calls this having "emotional agility," the ability to receive the messages behind one's emotions, make appropriate adjustments in behavior, release the charge of the emotion, thus returning to inner peace and balance. This practice is key to our personal success. Horses are our willing teachers. Also, it is my deepest conviction that as facilitators of such deep emotional stirring and development work, it is essential we are schooled, embodying, and able to provide our clients and students with the appropriate tools and practices of emotional strength building, responsible releasing practices, and guides for how to communicate the very intricate - language of the heart. FEEL™ is one of the fastest growing horse careers in the equine industry today. There have been and are many forms of therapeutic or learning experiences, that horses are providing the human community. Some include working with handicapped children, people with autism and ADHD, the blind, troubled youths, eating disorders, coaching and leadership, psychotherapy, also emotional and spiritual development. Everyone in the various forms of FEEL™ facilitation will contend that there is still much to learn about what horses can provide in a healing, supportive or personal development capacity. There are many organizations now involved in some form of horse-assisted therapy or learning process, or natural horsemanship. How it all started in reality, was centuries ago when Indigenous cultures across all continents first met the horse. Those living in harmony with the land knew how to communicate with horses in their own language. The Celts are some of the earliest known and recorded "horse whisperers." Once these cultures were introduced to the horse it was a genuine relationship of respect and listening that formed. This has spread over time, fortunately not lost, to private farms and ranches across the world. Formally, equine assisted programs began some fifty years ago in Europe by providing therapeutic riding to people with disabilities. In 1969, NARHA, The North American Riding for the Handicapped Association was formed. They set new standards for practices, training, exercises, safety and certification, and now there are over 650 NARHA accredited centers across the US and Canada. 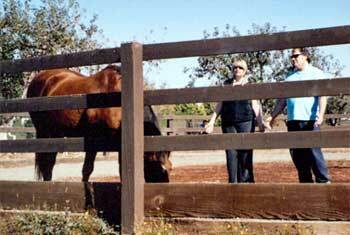 The equine-facilitated aspect of this work developed over those many years and gained recognition when EFMHA, Equine Facilitated Mental Health Association was formed in 1996, by Barbara Rector, M.A. Adventures In Awareness and Isabella "Boo" McDaniel, M.Ed. 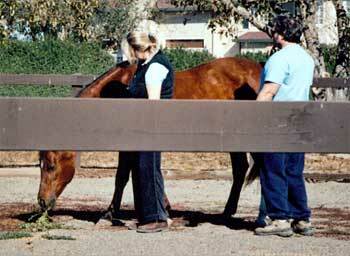 There have been many others not so publicly known such as, Bazy Tankersley who developed the Animal Therapy Association, and the McCormick family originally in Calistoga, California and now in Texas, who for over 30 years have an active equine psychotherapeutic facility, The Institute for Conscious Awareness. Ariana Strozzi of Strozzi Ranch Programs has been teaching leadership skills with horses and individuals or groups for over 25 years. And now the more widely known programs of the successful author of, The Tao Of Equus and Riding Between The Worlds, Linda Kohanov of EPONA Equestrian Services Apprenticeship Programs outside Tucson, Arizona. Out of all these various programs is the birth of a new relationship with horses spreading like wildfire across the US, Canada and Europe. Many new programs, facilitators and facilities are becoming available for this transformative experiential learning in emotional and spiritual development through the care and heart of the horse. HorseJourneys is committed to providing this service. All materials and images protected ©Copyright HorseJourneys, Inc.